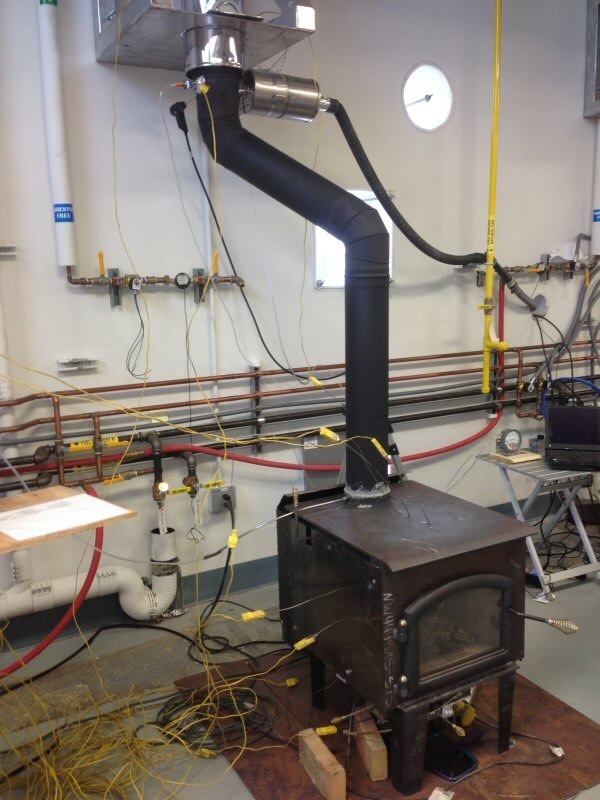 Seven stoves were selected to take part in the Collaborative Stove Design Workshop at Brookhaven National Lab in November 2014. Four are international entries and 3 are domestic. Three use catalysts. Five use fans. Four use batteries or battery back up. All are automated. During theWorkshop, the teams and workshop participants will witness the testing, review test results each morning and discuss how to improve each stove. There are limited spaces for participants and we are looking for high levels of experience in a stove related field. To apply, click here. This is a large Chinese manufactured cooking stove that is being adapted to a heating stove. It is a new concept taking advantage of the very clean technology now used. The combustion chamber is a refractory metal cylinder made from FeCrAl 18" in diameter and 28" deep. Output is about 24kW. Both natural draft and forced draft top lit up draft (TLUD) cooking stoves have scored well in recent EPA cook stove tests. Chinese stove researchers have been experimenting with batch fed top lit stoves for about two decades and several very large manufacturers sell clean burning TLUD cooking stoves. 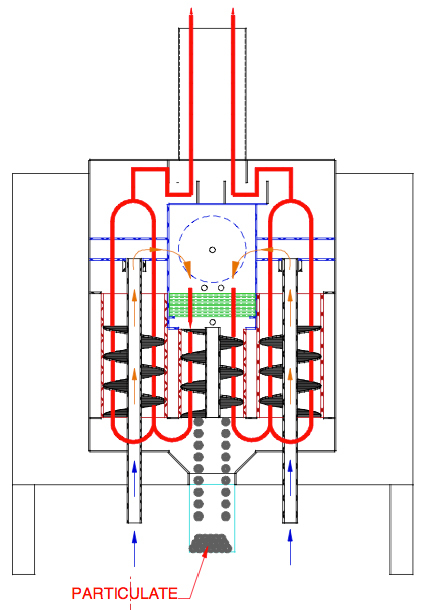 Primary air enters the cylindrical FeCrAl combustion chamber at the bottom regulating the rate of burn. Jets of preheated secondary air induce swirl and create a zone of superior mixing above the fuel. A unique Chinese invention, a hemispherical cap above the secondary air holes increases the combustion efficiency. Aprovecho has added a heat exchanger with access port to the stove. The heat exchanger is dependent on a large fan and surface area was added until exit temperatures approached ambient. The combustion chamber was tuned under the ARC emission hoods by Li Hiaxi as part of a DOE grant. The stove was tested using gravimetric measurement of PM 2.5 and the average of three tests was 0.25g/hr. The cost of the stove is estimated at below $500 wholesale. The Catalus Ventus is a catalyst-cyclone prototype designed to attach to the back of any existing stove on the market. The retrofit incorporates ClearStak’s preheated catalyst technology, a dual cyclone, and is managed by ClearStak’s automated control technology. The Catalus Ventus utilizes an active catalyst, which is preheated prior to starting and reloading of the wood stove. This ensures that the catalyst is working at its full potential to reduce the amount of carbon monoxide and particulate in the exhaust before exiting through the vent. 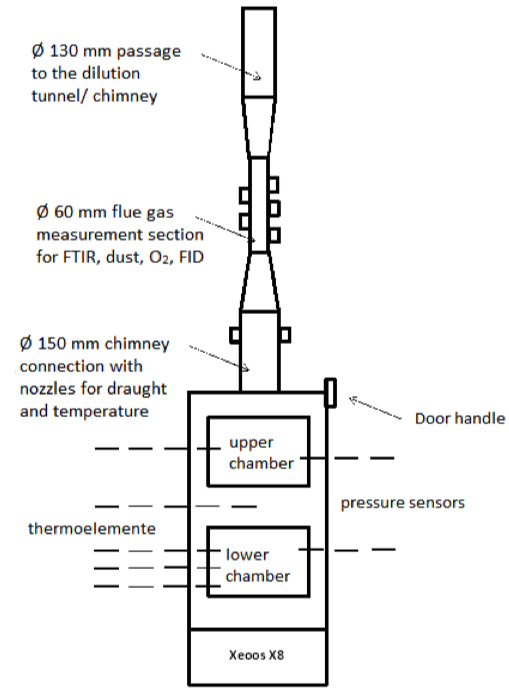 The automated controls incorporate the following sensors: a thermocouple to monitor the firebox, catalyst, and vent operations, and a Bosch oxygen sensor in the vent to ensure proper fuel-air mixture. The feedback from the sensors in turn, manages the opening and closing of a damper and a variable speed blower. Data collected by the automated control technology can be viewed wirelessly through a display and cellular application. Notifications such as text messages, emails, or push notification can be sent out to users for refueling and maintenance. The newly-developed Autopilot IHS™ (Intelligent Heat System) from HWAM A/S creates a more intelligent stove that can compete with pellet burning stoves, heat pumps, solar panels and other, non-fossil energy sources. HWAM Autopilot IHS™ not only controls combustion automatically – it also allows the homeowner to set the room temperature to the required level with the help of a remote control which even tells you when to refuel your stove. Electronic precision that benefits the environment reduces fuel consumption and makes life easier for the consumer. HWAM 3630 IHS features a control system that electronically measures combustion conditions through the use of a lambda oxygen sensor and a thermocouple. An onboard computer then allocates combustion air through three separate valves to help the consumer achieve the same results at home that are obtained in test labs under ideal conditions. This HWAM stove bears the Nordic Ecolabel. In order to be eligible for the Nordic Ecolabel, stoves must utilize fuel with great efficiency, among other things, and must comply with rigorous limits on local air pollution and emissions of dangerous substances such as carbon monoxide and hydrocarbons. 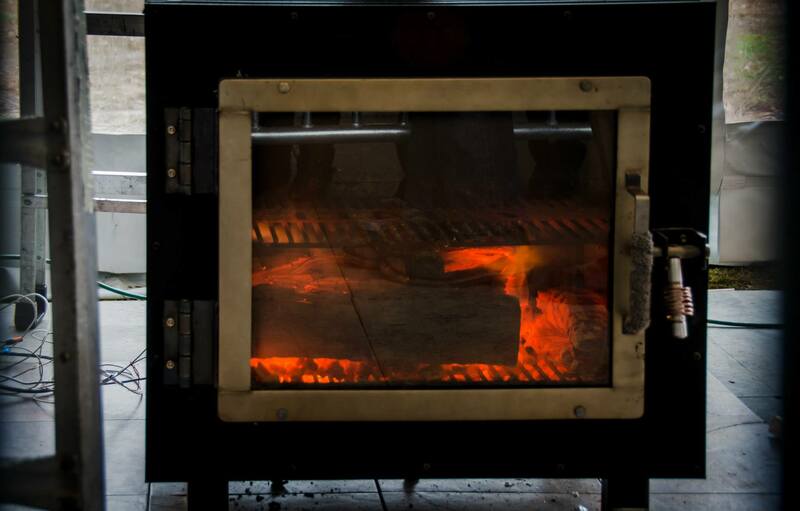 The Kleiss wood stove is an optimized wood burner - essentially a regenerative heat exchanger - with separate flow paths for primary and secondary air. Air in both paths is preheated to an elevated temperature, and electronic control algorithms provide optimal operation by varying airflow to each path. This provides a high-temperature combustion zone for burning solid wood fuels cleanly and efficiently. It operates without firebrick - temperatures being managed via airflow and insulated panels. The stove operates as an autonomous expert system, removing real-time operator adjustment once the fire is initiated. Rules contained in the algorithms enable the stove to effectively burn wood of varying quality and moisture content. As with any stove burning unprocessed fuels, the manual operations required are lighting the kindling fire and verifying that the flue has warmed up sufficiently to provide a draft before closing the loading door. Once the fire is started, the stove is totally and automatically controlled by a microprocessor from start-up to shutdown. The operator is only required to push two buttons: one button selects START, RUN or STOP, and the other sets the desired stove temperature. When available fuel is exhausted, automatic and complete shutdown capability minimizes draft losses. Once operating under electronic control, at reload events, wood is added and the operator again selects START. The stove also has automatic air intake shutdown, actuated upon over-temperature conditions or complete power loss. It also has a manual shout-down button. The stove is also designed with aesthetics in mind by having a large and efficient dual-pane ceramic glass viewing window. Electronics are designed to require minimal power, which offers various power options: on-grid (US and International), disposable battery or rechargeable battery via thermal electric generator or solar panel. The Mulciber Stove by MF Fire is an automated and catalytic residential wood burning stove. The Mulciber Stove utilizes a forced air internal ventilation system that is controlled by a variety of burn-box sensors. These sensors monitor the burning conditions within the stove in order to provide feedback to the smart controller. The smart controller then regulates the airflow, which optimizes burning and, in turn, increases burning efficiency and reduces particulate and carbon monoxide emissions. The previous version of the Mulciber Stove produced as low as 0.2 grams/hour of particulate emissions at the previous Wood Stove Decathlon. In order to power the ventilation systems, sensors, and controller, thermoelectric generators are used to generate electricity from the heat produced by the stove. 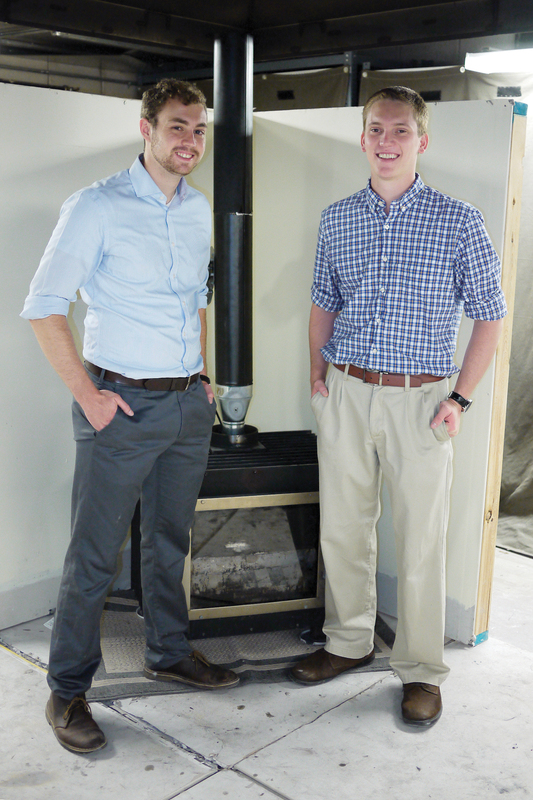 This model utilizes a few clever heat recovery techniques that also prevent waste heat from traveling up the chimney and out of the home, thus improving efficiency. 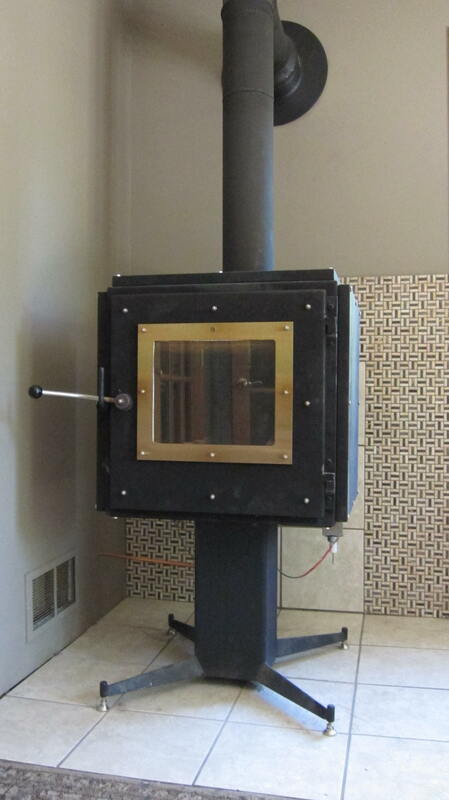 The Mulciber Stove is an ultra clean, high efficiency, and easy to use wood stove. Originally designed by two German engineers as a pollution control device, this environmentally friendly double - chambered Twinfire® wood burning unit has great heating output and low fuel consumption with less ash or simply put “a clean burning machine”. In addition to its visual appeal, all Twinfire® models utilize the unmatched patented combustion system for 93% efficient wood burning capacity and are EPA certified and approved to UL/ULC standards. The fire is started in the upper burning chamber. When enough flames and heat have built up (over 1800°F), you switch to the unique xeoos Twinfire® system by pressing the thermally decoupled silicone handle down and the heated gases pull through the uniquely shaped grate into the lower chamber and ignite into a blazing fire. These gases are reheated to create an almost total combustion. Specht(the Twinfire® manufacturer) has been working together with DBFZ (German Biomass Research Center in Leipzig) and with the University of Leipzig (Institute for Technical Chemistry) and have developed an amazing "catalyzer" (with a lambda sensor and temperature sensor with an extended lower burning chamber), which is able to reduce CO (carbon monoxide) and particles on a major scale. This manganese oxide catalytic converter has made a significant improvement to the emissions and efficiency. 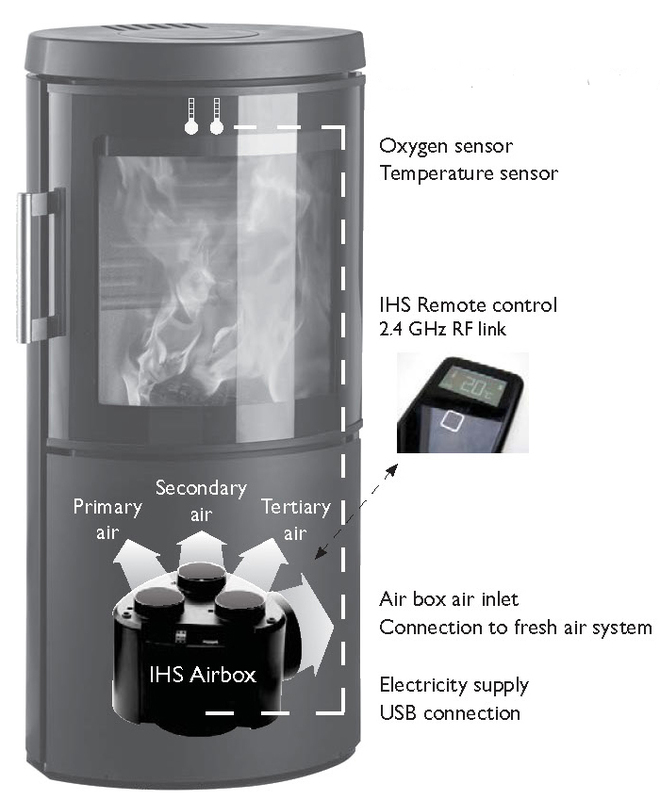 The temperature sensor automatically regulates the air control. Also new is the electronic indicator for refueling. The Twinfire® has taken a giant step towards the future of wood burning stoves. The VcV or “Kiwi Valve” is a barometrically operated variable choke venturi tube (VcV) that is used to control the amount of combustion air entering a stove, particularly at the lower burn rates. It is designed to maximize burn times while simultaneously reducing particulate matter (PM) emissions and increasing overall efficiency (%OE). Normally there are 2 VcVs on a stove, 1 for the primary air system and 1 for the secondary air system and each operates differently. This dual VcV system can be adapted for use on any naturally drafted wood stove and since it is mechanical, the VcV system does not need an external power source for operation. If a consumer closes the primary air control (PAC) early on a typical stove being sold today, the result can be an increase in PM emissions because the stove has not been brought up to proper sustainable operating conditions. The operation of the PVcV is specifically designed to prevent this from happening because even if a consumer were to close the PAC early, the PVcV will not automatically “pop up” until the stove has reached the proper sustainable operating conditions. The operation of the 2VcV does 2 things, (1.) it enhances starts by limiting the amount of secondary air entering the stove which enables a stove to come up to operating temperature quicker and (2.) by matching (optimizing) the amount of secondary air entering the stove with the static pressure over the entire burn cycle, both combustion efficiency (%CE) and overall efficiency (%OE) are increased/ optimized. The dual VcV system can be installed on either a catalytic or a non catalytic wood stove. With the 2 VcVs working in tandem, PM emissions are reduced, burn times are increased and the overall efficiency (%OE) is increased, resulting in lower emissions per unit of useful heat output. All without being “on the grid”!